Free Libre Open Source Lebanese Movement: We're so excited for 2014! Every winter, we launch a fundraiser to sustain our work for the coming year. 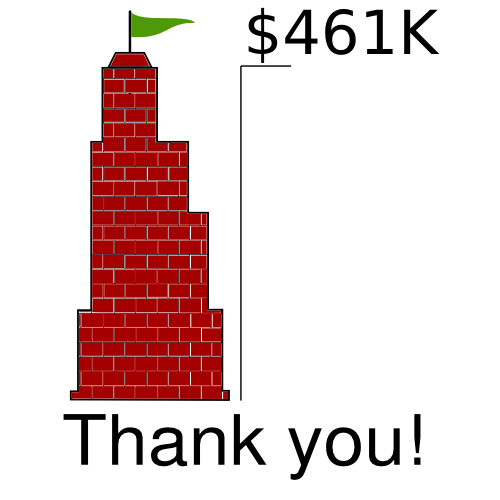 This time, we set out to raise $450,000, our highest goal ever. And because so many of you chipped in, we were able to reach it. Spearheading the free software movement's resistance against the Surveillance-Industrial Complex, recruiting skilled developers to the cause, and developing a guide to help new people get started with free software privacy tools. Running the biggest, best, and most diverse LibrePlanet conference yet. If you're one of the 388 people that joined as members during the fundraiser, remember that you can attend gratis! Expanding our work defending GPL-licensed software, bringing on more volunteers to expand capacity. The Licensing & Compliance Team will also add new exciting products to our Respects Your Freedom hardware certification program. Continuing to nurture the GNU System, so that it can remain a beacon of free software for another thirty years. Because of your contributions of time, skills, and money, we're ready to make these big goals happen in 2014. Chrissie, Donald, Jasimin, Jeanne, John, Joshua, Libby, Lisa, Nico, William, Zak and, of course, Richard. P.S. - A special additional thank you to those of you that have embedded our widget on your Web sites and blogs -- you amplify our reach tremendously. You can unsubscribe to this mailing-list by visiting the link https://crm.fsf.org/civicrm/mailing/unsubscribe?reset=1&jid=129406&qid=6807541&h=fe60fdb50be60cf9.